June 2018- All the waters are fully stocked and fishing has been excellent. We have 6 rivers to choose from and too many ponds to count. 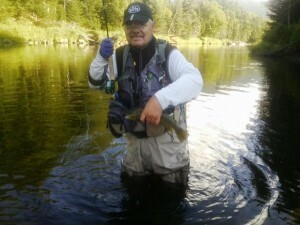 Now is the time to book an exciting river or pond trip or come up and learn to fly fish. When water temperatures top 70 degrees it puts added stress on the trout and mortality rates increase dramatically…even if you handle the fish carefully. This time of year it is important to take readings with your stream thermometer and seek cooler water when the rivers warm up. Remember that water changes temperature more slowly than air does, so even if the air feels a bit cooler in the evening that doesn’t mean the rivers have had enough time to drop to suitable temperatures.